We’re taking the popular method to race shirts, medals, shoes, and gear. They can’t all spark joy. 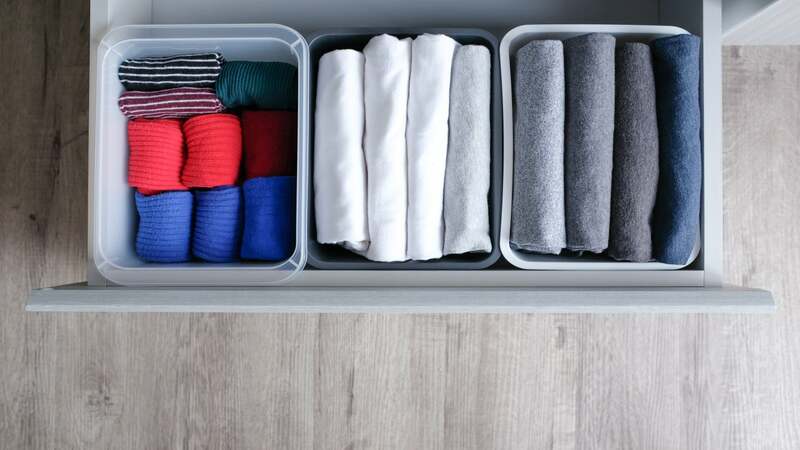 If you haven’t heard of Marie Kondo or the “KonMari method,” you’re probably logging way too many miles. Kondo is the author The Life-Changing Magic of Tidying Up: The Japanese Art of Decluttering and Organizing, but more recently she starred in a Netflix series called “Tidying Up,” mesmerizing viewers with her strategies for simplifying and organizing absolutely everything in our possession. When the show started streaming, my husband—who read the book and started folding his shirts vertically—and I quickly fell in love with Kondo’s approach. We moved a year ago so we had done a big purge, but there was certainly room to jettison more belongings. And we could do a lot better at organizing what we kept. To say I have a few pairs of shoes and some gear would be a flat-out lie. I’ve run hundreds of races over the years, the swag—medals, shirts, mugs—adds up. Inspired by Kondo, I decided to take another look at my running paraphernalia and keep only what “sparked joy,” as Kondo preaches. After all, living in clutter can take a mental toll. Here’s how you, runner, can approach the daunting task of organizing and de-cluttering your practical and sentimental running gear. Plan which gear you want to keep. Runners who train for races are (for the most part) good at planning. Take this strength and apply it to organizing your life. 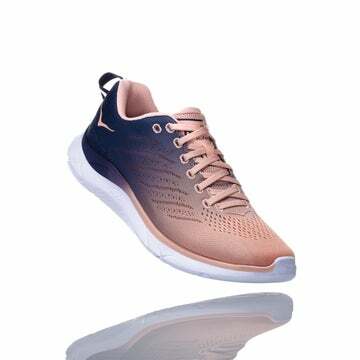 It can be easy to get caught up filling your closet with that favorite running shoe you love because it was on sale and you know that model will change, or you have a friend who tried a sports bra, didn’t like it and passed it on to you. How can you say no? “Evaluate what you have and don’t take more [if you don’t need it],” says Gayle Goddard, a Houston-based professional organizer and member of NAPO. When it comes to your running clothing and shoes, they have an expiration date, and there’s no reason to hang onto it after it stops performing, Goddard says. When your gear is past its running prime, you can donate it if it’s still in wearable condition or recycle it. Goddard recommends going through your items every few months to avoid buildup. After I decided what items I was keeping, I focused on smart organization. 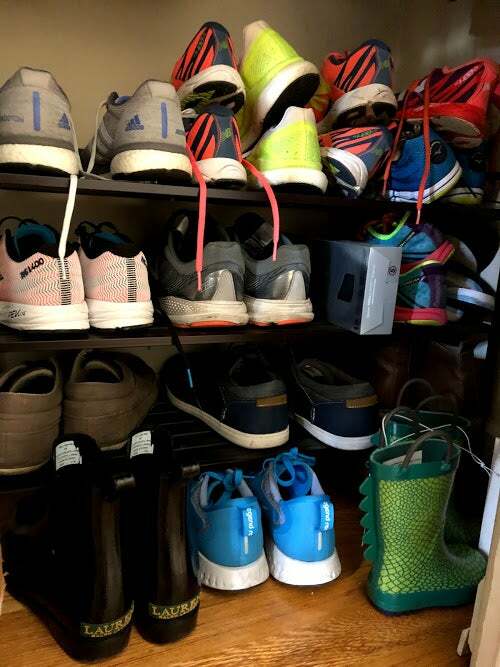 Running shoes went on a shelf in the front closet; I stored out-of-season clothing in large plastic containers in the basement, leaving closet and under-the-bed storage for items I was using daily. Choose one item per event. Keep special race medals in a vase. Races certainly give you plenty of items to remember your event: shirts, bibs, medals. But you don’t need all of them. Goddard says it’s best to decide in advance what keepsake you want to hang on to. If it’s a mug, your cabinets or shelves need to have space for it. “Plan for the volume you expect to do,” she says, noting that if you run 100 races, keeping bulky items like mugs might be challenging. When it comes to sifting through the sentimental items you’ve collected over the miles, purging can be a little more challenging. For a while I kept the bibs from races where I ran a personal best. I’d go through them from time to time and ditch the old PR bibs. 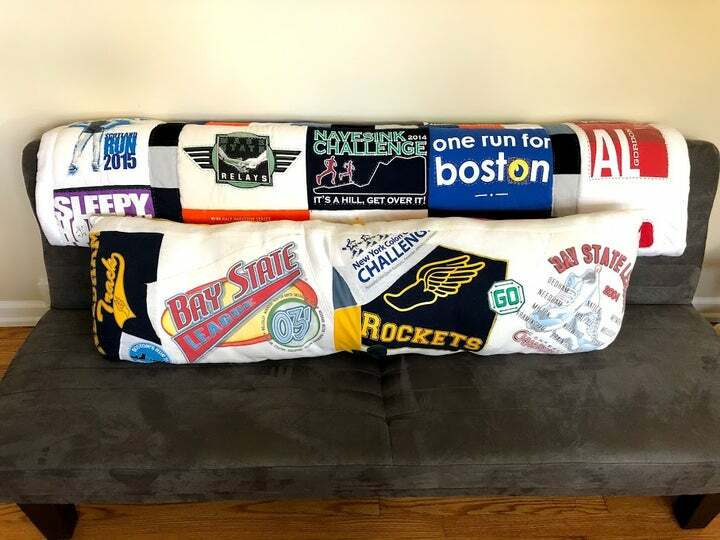 But after “Marie Kondo-ing,” I decided I didn’t need the bibs at all—save for my seven marathon race numbers and one signed by 1968 Boston Marathon champion Amby Burfoot. 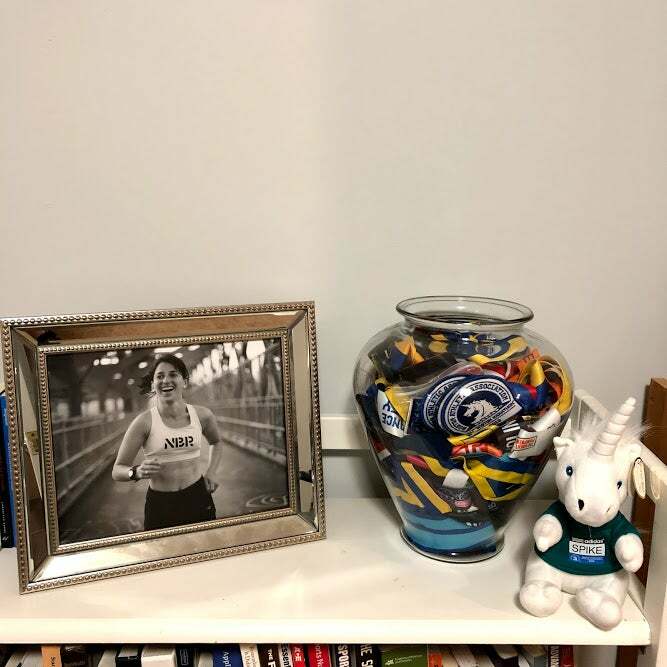 I keep all of my medals in a large vase, but the only ones that have any meaning are from my marathons, my first postpartum race, and my first Boston Athletic Association event, which I got after running the 4 x 400-meter relay on Boylston Street when I was 11. I haven’t yet gotten rid of the rest because they’re tucked away—out-of-sight-out-of-mind can be dangerous—but I’m planning to donate them. You only need to keep so many race shirts. Be honest: How many times have you taken a race swag bag that you really didn’t want but felt obligated to because it was free? We’ve all been there. I started turning down the race bags and I don’t miss a single item. I also no longer take a shirt. I don’t wear them, and I already have a quilt and a body pillow stitched from my collection (with another quilt in the works). I’ve gotten to a point in my running career where I have the memory of the race in my mind, the Internet result, and on a good day, an award, which I always keep. Don’t hide memorabilia—show it off. 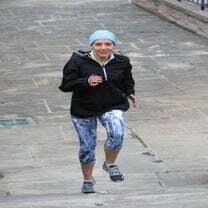 Put your favorite race photos where you can see them. Let’s be clear: There’s nothing wrong with keeping items that have special meaning. Kondo emphasizes the importance of showcasing the items that are important to you instead of storing them away. But that’s not always realistic. My race photos bring me joy, but a minimalist décor makes me happier. 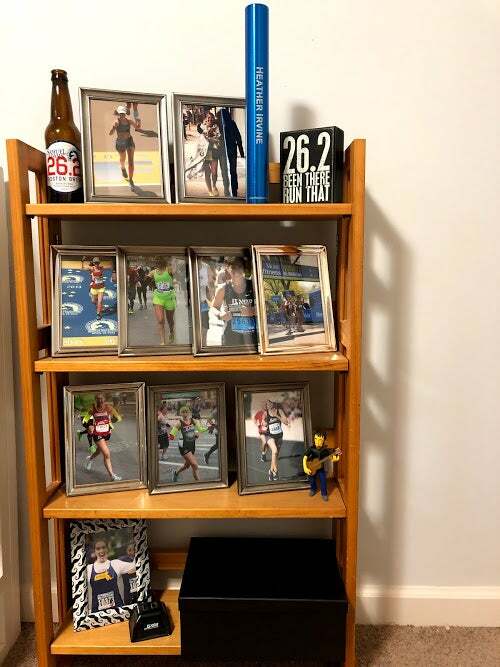 My seven framed marathon photos are on a bookshelf in the basement next to my medal vase. The corner of that basement room has become my little runner shrine. Professional organizers like Goddard and Stankowski also tell their clients that it’s okay to store sentimental items, but the storage box or folder should be easily accessible to allow you to head down memory lane in a stress-free way. That said, if something really makes you proud, display it. For Stankowski, that’s her marathon finisher’s medal, photo, and certificate, which are all framed and hung in her basement. Stankowski has run just one marathon, so her keepsake approach may not be feasible for runners who have run dozens of races, unless you have limitless wall space. For me, I have a framed photo in prime living room space that shows me, six months pregnant, handing off a baton to my three-month pregnant training partner in a relay. Taking photos of your race items is also a good way to preserve the memory and live without the clutter. Digital clutter is another issue, but maybe it’s worth having the extra hard drive so my shelves are clear. Here’s where I diverge a bit from Kondo’s approach. The organization guru emphasizes the importance of undertaking a big cleanout at once and making tidying a ritual, not a daily chore. Although she notes that you will, of course, clean and put away things you use every day. I don’t disagree with her philosophy, which is that you have to change your mindset about your belongings (Do I really need this?) before you try to maintain your tidied house. That said, now that my house and running things are organized, we are constantly maintaining that tidiness. When it comes to my running clothes, every few months I take them out and evaluate what I want to keep and what I can let go. That schedule can be whatever feels right. 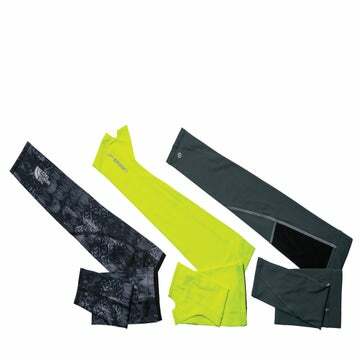 One approach is to go through your shoes, clothes, and gear as the seasons change and you’re swapping tights for shorts. And any time you bring in a new item like shoes or a sports bra, the old one goes out, Stankowski says.